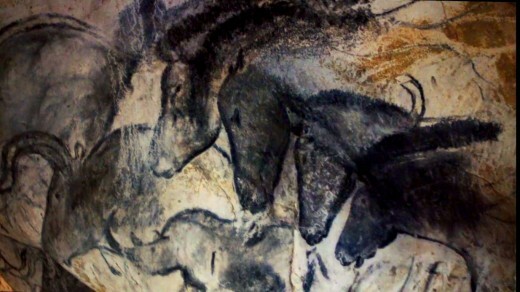 Cave of forgotten dreams is a great documentary made on the Chauvet cave by the maestro director Werner Herzog. A small team of few selected paleontologists, historians, scientists, along with Herzog and his camera crew is permitted to enter the cave. The team is reminded that the cave is invaluable and all the team members are instructed not to touch anything, walk along the metal pathway carefully laid before and not to step on the floor. As the team descends into the claustrophobic cave, first appears some imprints of human palms. Deep down the cave starts appearing beautiful paintings of boars, rhinos, horses, and other wild animals. The paintings are not just beautifully crafted, they are ingeniously drawn - 3D effect is produced by using the depressions and protuberances on the cave walls. That is why Herzog has made the film in 3D. The paintings are about 32000 years old and they remained well preserved for such a long time because of a landslide that occurred in ancient times closing the cave’s entry with debris. Humans 30000 years ago were sensitive, artistic, spiritual, and communicated in complex languages like their counterparts today. Modern humans or the Homo sapiens, as they are called in Biology, appeared around 200,000 years ago. Homo sapiens are not the only human species that ever existed, other similar species also roamed this planet, but they went extinct. Human evolution is a long process—millions of years old—so it is difficult to choose where to start from to tell its story. The last common ancestor of human and chimpanzee would be an appropriate starting point for this grand story. This last common ancestor is supposed to have existed 7 to 8 million years ago (mya). This time period is calculated from the difference in the DNAs of humans and chimpanzees. Their DNAs differ by 1% and such a difference requires 7 to 8 million years to take place according to scientific observations. Two evolutionary lineages sprouted from this common ancestor: one lineage has chimpanzees at one of its leaves, whereas the other one contains the modern humans at its end. 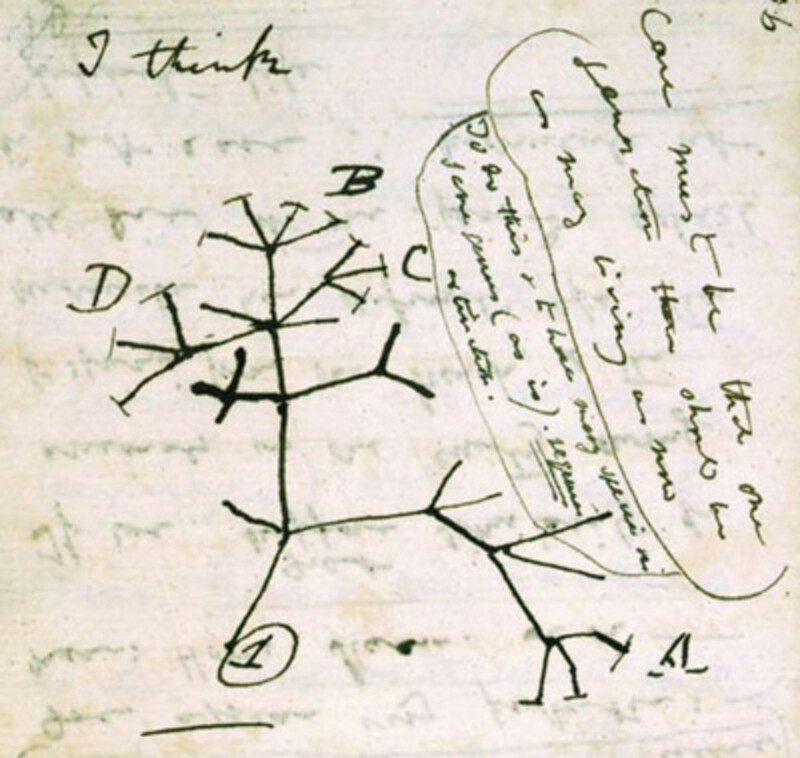 The human lineage is not like a line; it is like a tree, But all the leaves and nodes of this tree became extinct. Only one leaf (It is a leaf at present), the Homo Sapiens, survived to tell its own story. All the species that fall on the last common ancestor to human lineage are called hominins. About 7 million years ago, in Africa, a historic event took place: apes that had walked on four legs started walking on two. It was a small swaggering step for an ape; a giant leap for the mankind. 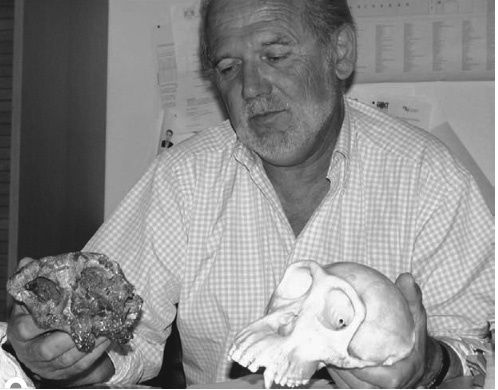 French Paleoanthropologist Michel Brunet was searching for fossils of oldest human ancestors. He and his team went on expeditions after expeditions but returned empty-handed. On his 26th expedition in 2001, Brunet’s team found a deformed skull of some species that had not been found yet. On examination, the skull turned out to be 6 to 7 million years old. A 3D computer image of the skull was generated and its 3D printout was taken out. The fossil was named Sahelanthropus Tchadensis; it is the oldest human ancestor found till date. 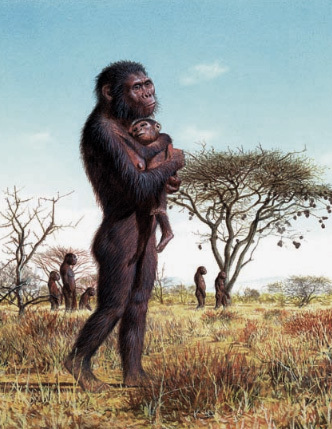 Sahelanthropus Tchadensis must have come into existence not long after the human and chimp lineages had diverged. Its brain size was about a chimp’s brain, but its facial features were a little different from chimps.Its body was smaller than chimps and humans. The skull suggests that Tchadensis was bipedal—it walked on two legs but not very efficiently. Why did the apes start walking on two legs? What advantages bipedalism endows? The answer to these questions is that when African forests turned into grasslands due to climate change, natural selection favored bipedalism as it offered many advantages. The body of a bipedal is exposed less to sun, the creature can look far enabling him to recognize any food or predator from a distance, and the most important of all is that less energy is consumed walking on two legs. A chimp spends four times more energy than a human walking the same distance. 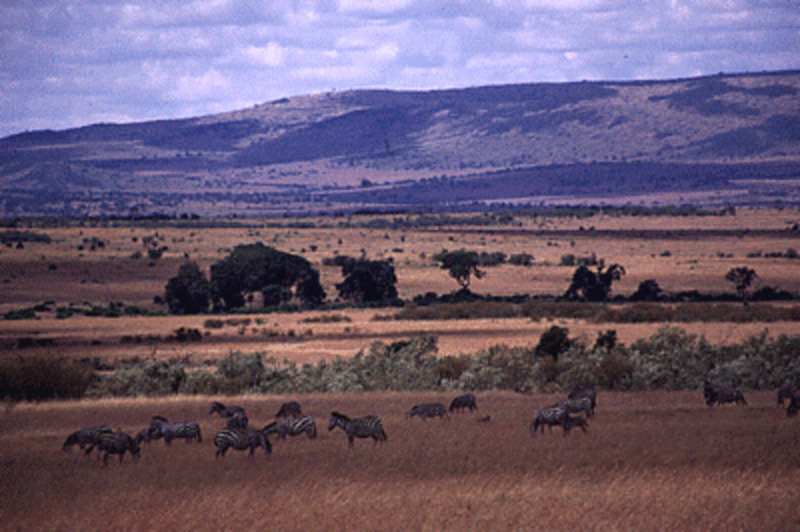 13 fossils from five individuals of an unknown species were found in the Tugen village in Kenya in 2001. These fossils were 6 million years old. It was inferred from the fossils that these creatures could walk upright and climb on trees. Though their brain size was same as that of Sahelanthropus Tchadensis, they were better bipeds. Fossils of a new hominin species were found during a series of expeditions led by Tim White during 1992-1994. The fossils contained 17 cranial, facial, dental, and upper limb bones, and they were 4.4 million years old. The species had to be put in a new genus—Ardipithecus—and its species was named Ramidus. It was nicknamed Ardi. Ardi could both walk and climb on trees. Its pelvis suggests that the evolutionary forces were cutting back on the ability of arboreal climbing and building up bipedal locomotion ability. The brain size had not increased even after an evolutionary journey of about 2.5 million years from the split up of the last human-chimp common ancestor. Australopithecus Afarensis evolved from earlier species into a fully distinct species around 3.9 million years ago and went extinct around 3 mya. These precise claims could be made because many australopithecine fossils have been found (and many of them in quite fine conditions) and studied in detail using modern technology. 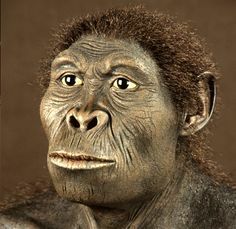 The A. Afarensis fossils were discovered at Laetoli in Tanzania, and Hadar in Ethiopia; the former were discovered by the team of the eminent paleoanthropologist Mary Leaky in 1978, whereas the Hadar fossils were found under the direction of Don Johanson in 1974. 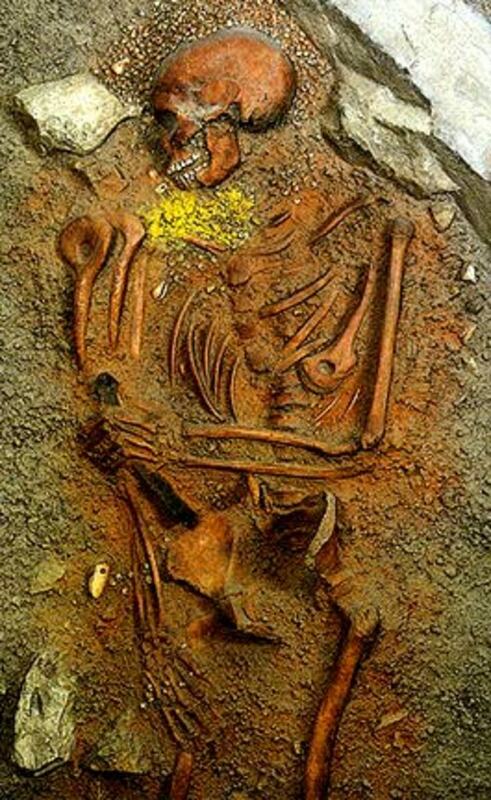 One sensational discovery at Hadar was the Lucy skeleton. No non-human skeleton has enjoyed as much fame as Lucy’s; even google honored the 41st anniversary of Lucy’s discovery with a doodle on 24th November 2015. Lucy was 3 to 4 feet tall, her exact height could not be ascertained because the skeleton found was not complete – it was only 40% complete. The Laetoli site was full of footprints of hominins and animals of that time. A trail of footprints more than 75 feet long made by three individuals was found. These footprints tell that Afarensis was bipedal. They walked slowly with short strides. They were habitual bipeds, but it can’t be precisely told how much time they spent on trees. In the year 2000, a fossilized skull and other skeletal remains of an A. Afarensis were found in Ethiopia. The fossil was of a 3-year-old child. It was nicknamed Selam. This fossil was a telltale sign that Australopithecus Afarensis had come a long way in its journey from an ape-like creature to human like. In humans, childhood is much prolonged. Salem died when she was 3 years old, but her brain had developed only 75% of an adult A.Afarensis brain. In a 3-year-old chimp, the brain is developed more than 90%. In biological taxonomy, a species is named so that its genus and its species are evident. Closest species are put under one genus, for example, lions, tigers, and leopards belong to the same genus Panthera. Their zoological names are Panthera Leo, Panthera Tigris, and Panthera Pardus respectively. The latter term in the name denotes the species: lions are a different species (Leo) to tigers (Tigris). The modern humans are called Homo Sapiens—they belong to the genus Homo and they are a different species called Sapiens. There have been many ‘homos’ in the past, but everyone died out except the sapiens. Australopithecus Afarensis is a link in human evolution, but it was not qualified to be put under the genus Homo. The oldest known species of the Homo genus was Homo Habilis which emerged around 2.5 mya. Archeologists have not found any hominid fossils of the period between 3.2 mya to 2.5 mya. But they discovered something astonishing that dates back to the period 2.6 mya to 1.7 mya: hammerstones, stone cores, sharp stone flakes, and other stone tools. Archeologists call these tools Oldowan tools. The flaked stone tools were made by holding the hammerstone in one hand and striking a stone core held in the other. This method is called knapping. It may sound simple, but it requires some practice and certainly some ingenuity. Australopithecus Afarensis was not capable enough to make these type of tools. So who was this mysterious knapper? Lucy was discovered in 1974 as mentioned before. Before Lucy, in 1960, a team led by the anthropologist couple Louis and Mary Leaky had unearthed fossils of a new species at Olduvai Gorge in Tanzania. The species was named Homo habilis and nicknamed ‘Handyman’. Homo habilis emerged around 2.4 million years ago and went extinct around 1.5 mya. The knapper of those early paleolithic stone tools was the ‘Handyman’. H. Habilis had a large brain—about 700 cm3 –almost double to that of the A. Afarensis. It was not taller though, against expectations, it was only 3 feet tall—as tall as Lucy. Endocasts of Habilis’ skull exhibit more humanlike facial features; gone was the elongated chimp-like snout. It had dexterous hands, which it used to make stone tools. Habilis had learned to extract marrow from scavenged bones using these tools. Homo habilis trumpeted the dawn of a new era, the era of the genus Homo, the era of humans. Since its evolution from the last human-chimp common ancestor, the ‘human-ape’ had rewired its brain a bit but its size did not increase. What happened during such a small evolutionary time of 700,000 years that doubled the brain size of the australopithecines, eventually bringing into existence the handyman—originator of the genus Homo? Geologists have found evidence that between 3.3 mya to 2.5 mya, Africa went through extreme climate change many times. Those who were rewarded with larger brains through gene mutations had a better chance of survival. This ‘larger brain’ trait accumulated over multiple mutations and natural selection; eventually, a new smarter species was born. Even with its bigger brain size and despite being the first ‘Homo’, H. Habilis was still more ‘animal’ than human. The next character who entered the stage in the human evolution story was a real human who had doffed all its animalness. 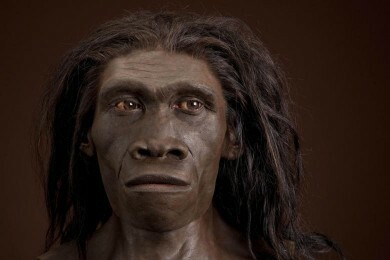 It was Homo Erectus. If you saw a Homo Erectus standing 100 feet away you would think it was some giant tribesman standing naked. Homo Erectus was the first hunter, the first complex tool maker, the discoverer of fire, and the first explorer. Homo Erectus originated in Africa about 2 million years ago. Many Erectus groups migrated from Africa and settled in Europe and Asia. This inference is based on the findings of Erectus’ fossils—around 2million years or less old—in different parts of the world. There are some minor anatomical variations in Asian and African fossils but it is certain that these are remnants of the same species; the little variations are accounted to different geographical and climatic factors. A nearly complete skeleton of Homo Erectus was found in 1984 near Lake Turkana in Kenya by a team led by Richard Leaky. This skeleton was nicknamed Turkana Boy. He had died at the age of eight years. Even at such a small age, he was 5 feet 3 inches tall. Turkana Boy and other Homo Erectus fossils helped know the brain size and body structure of the Homo Erectus. Homo Erectus were robust and tall; an average adult was more than 6 feet tall. The brain size of an adult homo erects was 900 cc. It had dextrous hands, like modern humans. Homo Erectus could not only walk but also run on its two legs. Other significant H. Erectus fossils were found in Indonesia and China. Skeletal remains of an H. Erectus was found way back in 1891 at the Indonesian island of Java. It was nicknamed the Java man. In china, the Peking man was discovered in the 1920s. Apart from having developed a big brain, Homo Erectus looked very much like modern humans. If you met two Homo Erectuses Tom and John, you would recognize who was Tom and who was John the next time you met them; you certainly cannot distinguish between two gorillas by their facial features. Their potent brains enabled Homo Erectus to approach the world and its challenges in a novel way. They were the first imaginative, creative, and emotional beings. They cared about each other like a truly intelligent and social animal. They were a successful species who survived for more than 1.6 million years. Homo Erectus evolved into modern human species. In Africa it evolved into Homo sapiens, and in Europe into homo Neanderthalensis. Homo sapiens emerged around 200,000 years ago. From Africa, Homo sapiens migrated to other parts of the world. This theory is called out of Africa theory. In Europe Homo sapiens met Neanderthals. Neanderthals were not as a smart as Homo sapiens. Sapiens had better weapons than Neanderthals. Sapiens had spears which they could use to hunt animals from a distance. Neanderthals had no such projectile weapons. For them, hunting was a risky business. 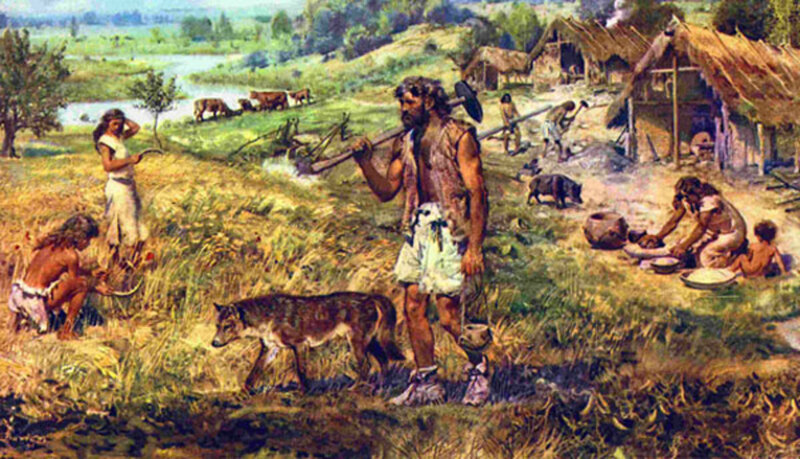 To hunt animals they had to go near the preyprey and kill them with hand-held weapons. Also, Neanderthals were not as social as Homo sapiens were. Sapiens could work in large groups in coordination. This ability to work in coordination made Homo sapiens a very successful species. When sapiens and Neanderthals came face to face in Europe, they became rivals. Neanderthals were no match to the smarter sapiens; sapiens vanquished Neanderthals with their advanced weapons and coordinated attacks. Homo sapiens conquered almost all the territories and drove away Neanderthals to a small location. Almost all Neanderthals were killed and the remaining few died soon. When Homo sapiens emerged 200,000 years ago they were not as a smart as the modern humans. Around 70,000 years ago, a cognitive revolution took place. Homo sapiens developed complex languages to communicate. This revolution would turn sapiens into sophisticated human beings who could tell fiction and use symbols. Around 50,000 years ago, many of them left Africa and reached other parts of the world. Apart from Neanderthals, they met other human species – those Homo Erectuses who had not evolved into newer human species were one of them. Homo sapiens conquered the world and still exists today while all the other human species went extinct. This smart creature has set foot on the moon. It was a small step for a man, a giant leap for the mankind. Do you think human are still evolving? Are Humans The Perfect Species? Great summary of evolution. Good job. Sharing everywhere.